Health workforce (HWF) is a cornerstone of every healthcare system and has a key role in the operation of high quality and safe healthcare provisions. 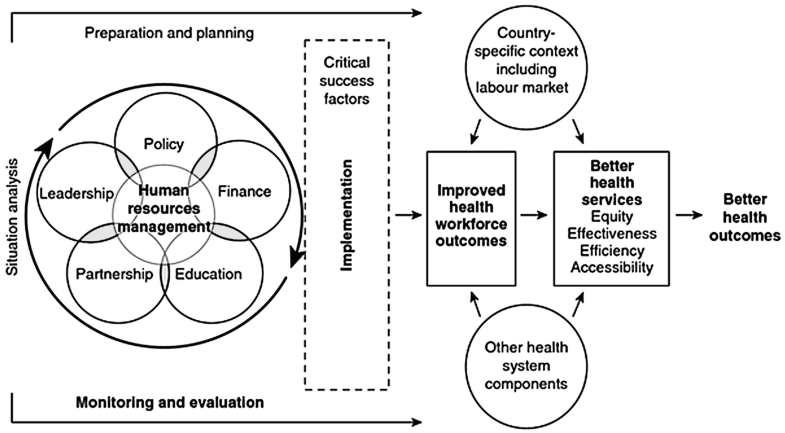 Health policy often carries out strategic HWF development and planning and considers macro-level factors that might influence the operation and sustainability of the system. However, the following are often neglected from this perspective: mental health and well-being characteristics of the HWF. Mental health promotion is an essential dimension of any HWF development, since health professionals belong to a highly vulnerable profession, facing physical, mental, and emotional challenges in their daily routine. Additionally, chronic stress and the lack of supportive working environment might result in burnout. Several research studies have aimed to study different aspects of burnout (e.g., stages, volume, etc.) and identified holistic approaches to cope with emerging challenges. 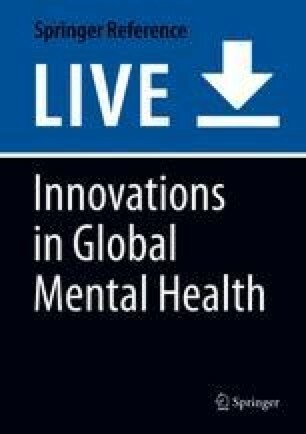 The present chapter aims to review contemporary literature and emphasize significant topics related to improving mental health and HWF development. As key messages, we underline the importance of the holistic approach and the role and responsibility of multiple environments. Policy makers, organizational management, and health professionals are inevitable stakeholders in developing mental health and well-being of HWF, such as ensuring sustainable and resilient HWF for providing care to population needs in a long time run. Stakeholders on all level (individual, organizational and policy) should define explicit interventions jointly in order to analyze the situation, monitor changes, educate the HWF, and prepare suitable programs improving mental health. In this chapter, the relationship between health workforce planning and the need for healthy HWF in light of mental health and burnout literature is described. As mental health is part of the holistic health concept, we highlight the biopsychosocial-spiritual (BPSS) model: incorporating the biological, psychological, social, and spiritual factors affecting the health status and especially the psychological vulnerability of health professionals. Holistic health approach is an ancient approach of life, taking into account all aspects of the individual (both physical and psychological) and as well as aiming to achieve the maximum well-being of the individual. The BPSS model serves as a framework or paradigm along with the concept of holistic health approach. Mental health promotion in HWF development is getting more and more prominent by raising the number and significance of implementations of burnout prevention and intervention. There are several challenges that hinder progress in strategic HWF planning. Perhaps the most prominent challenges are the physical and mental health of the HWF (e.g., chronic fatigue, exhaustion, chronic stress, and burnout), which influence effective patient care. As Maslach and Jackson emphasized “when the workplace does not recognize the human side of work, then the risk of burnout grows” (Lackritz 2004). Therefore, it has been recognized that HWF planning actions should focus on mental health promotion and consider improving the well-being of health professionals in order to implement appropriate strategic actions. The Geneva Declaration was adopted by the World Medical Association in 1948 and was revised by the Association in 2017 (see: www.wma.net). Decision was made regarding adding a requirement for physicians to attend to their own health, well-being, and abilities in order to provide care of the highest standard. By approved revision, it was strengthened that healthy HWF has a key role in any health care systems, particularly by influencing directly and indirectly the quality of patient care (Cimiotti et al. 2012; Rosenstein 2011; Rosenstein and O’Daniel 2008). However, not only should health professionals take care of their own health but health policy makers, institute leaders and managers should also actively and deliberately participate in improving mental health and well-being of the HWF. One of the organizational metaphors of Morgan (1986) is the “organizations as organisms”: It postulates that all organizations must be adaptive to the challenges and changes that occur in their given environment in order to maintain the homeostasis of the “organism” and thus successfully survive. Taking into account the heterogeneity and turbulent nature of the macro- and microlevel challenges of healthcare systems, decision-makers and health policy should support healthcare organizations and thus HWF to become resilient and adaptive to the frequently occurring changes in order to maintain the homeostasis on both levels. On the level of the individuum in order to maintain this homeostasis as a framework is worth to adapt the so-called ecological model that focuses on the nature of people’s transactions with their environment. The core concept of ecological model emphasizes that behavior and human development has multiple levels of influences, often including intrapersonal (biological, psychological), interpersonal (social, cultural), organizational, community, physical environmental, and policy factors (Bronfenbrenner and Morris 1998; McLeroy et al. 1988). Health behavior affecting mental health (self-management, self-reflection, motivation for a healthier life, etc.) is thought to be maximized when environments and policies support healthful choices, as well as individuals are motivated and educated to make these choices. According to the concept of ecological model, an ecological approach to create more mentally healthy health professional – particularly focusing on mental health promotion and burnout prevention – is discussed incorporating the messages of this chapter. Quoting Dr. Hans Kluge, Director of the Division of Health Systems and Public Health at WHO Europe: “The health workforce is the beating heart of any health system, and the cornerstone of universal health coverage” (WHO 2016a, b; World Health Organization Regional Office for Europe 2017). Without the right numbers, right skills of health professionals, health care to the population can hardly be provided appropriately (Dal Poz et al. 2009; EC 2012a, b; Fellows and Edwards 2014). The terms “human resources for health” (HRH) and “health workforce” (HWF) are often used interchangeably and cover a broad category of health professionals. Several studies investigated the composition of healthcare systems and research was carried out in order to explore the extended range of health professionals contributing to the operation of healthcare systems (Aszalos et al. 2014). The Joint Action on European Health Workforce Planning and Forecasting program (JA EUHWF) was an overarching project between 2013 and 2016 that explored many aspects of the HWFs in different EU member states (MS) and aimed to reveal the various practices of national and regional level HWF planning and forecasting policy practices. During this project, a network of experts in the HWF planning field was built and crucial discussions focused on the clarification of HWF terminology, HWF data categories, and planning models (Aszalos et al. 2014; Kovacs et al. 2016). The work is in continuation in the frames of the “Support for the health workforce planning and forecasting expert network” joint tender (2017–2020) supported by the Health Programme of the EU (see http://healthworkforce.eu). The international agreement on the main HWF categories (Fig. 1) is following the definitions of the common data collection by OECD/Eurostat/WHO-Europe “Joint Questionnaire on non-monetary health care statistics” (Stig and Lütz 2011). The first category summarizes the “Licensed to practice” professionals, which refer to the health professionals who are registered and authorized by the local authorities and entitled, fit to practice in the given country. This number does not show explicitly the practicing professionals involved in direct patient care. Secondly, the “Professionally active” category defines those professionals who might be licensed to practice and providing care. Nevertheless, usually they are not working in the healthcare but most likely they work at health organizations, public administration, competent health institutes, and companies with the scope of health-related issues or other sectors, e.g., health system research, healthcare management, and health education. The third harmonized category is the “Practicing” professionals, who are licensed, participating in the patient care, and provide direct services to patients on a daily base. If we consider the practicing professionals, the health professions themselves can be distinguished. In the European Union, there are five regulated sectoral professions – nurses, midwives, doctors (general practitioners and specialists), dental practitioners, and pharmacists – falling under the EU Directive on Mutual Recognition of Qualifications (2005/36/EC). The directive lists all sectoral professions and establishes the diploma equivalency, therefore enables free movement of health professionals in the EU as these professions are automatically recognized in the EU MS. Professionals indeed must apply to the local authority responsible for recognitions, then the authority checks the knowledge, competences and skills, fitness to practice and provides proof of qualifications. Registration and licensing seem to cover similar processes; however, they show a wide variety in the EU. Previous projects investigated thoroughly these phenomena, which aim to ensure that professionals achieve minimum standards of competence (Kovacs et al. 2014; Legido-Quigley et al. 2008; Solé et al. 2014). The term licensing summarizes the process of authorization or authenticating the right of a health professional to engage in medical practice, its monitoring (regulation), and renewal or extension. Registration on the other hand concerns all the processes associated with the issuing of licenses/authorizations to practice medicine and ensuring that the professional activities carried out under this authority maintain the professional standards on which it is based. 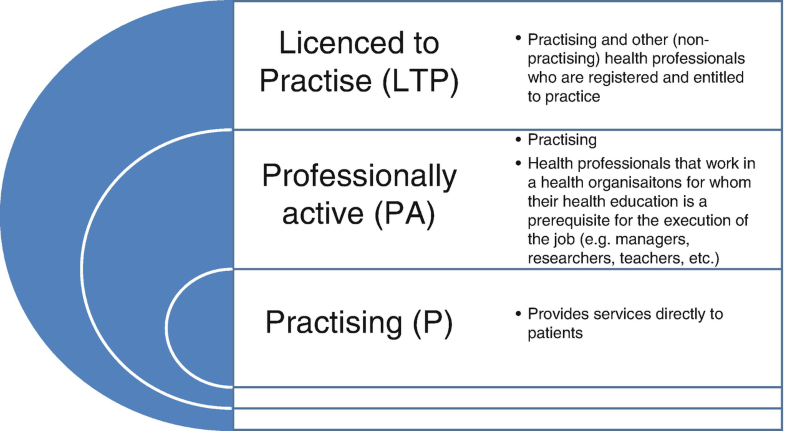 The aforementioned processes are strongly linked to the revalidation or reregistration of licenses, exploring the fitness to practice and resiliency or monitoring continuous professional development (CPD). 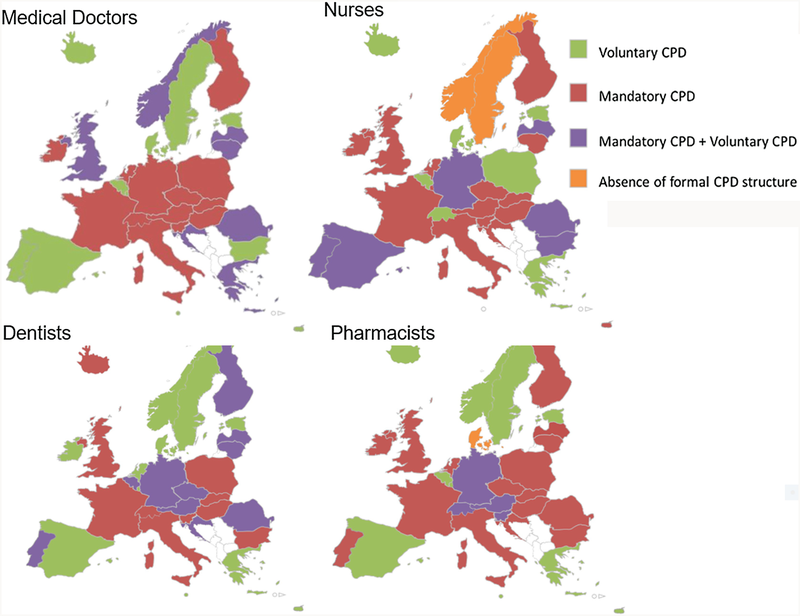 Figure 2 shows the widespread variability of CPD systems in the EU MS, where mandatory and voluntary processes exist parallel in the different professions (EC 2013). The main objective of revalidation is to revise regularly the fitness to practice of health professionals, who are involved in patient care. Revalidation might occur in every fifth or seventh year, based on the legal frameworks of the countries. For instance, in Slovenia and Hungary, although graduation entitles the individual to registration, the licensing process is separate and time limited. Both processes (registration and licensing) must be completed to practice. The UK has followed suit in 2013–2014. In contrast, in Romania, the license is issued on completion of training whereas registration confers the right to practice. In Belgium, a license (so-called “visa”) is issued automatically after graduation. However, doctors must then register on the “cadastre” to be able to practice. In Germany, health authorities at regional (Land) level award lifelong licenses that recognize the fitness of doctors to practice but they must then register with the Chamber of Physicians in the Land in which they intend to work (or where they live if they do not intend to work). If they move to a different Land, they keep their license but change their registration (Kovacs et al. 2014). Not surprisingly, the sectoral professions in the EU are appropriately monitored, however, not all health professions and occupational groups fall under the EU Directive of mutual recognition, therefore the need official registration might vary significantly, e.g., physiotherapist, psychologists, or allied health professionals. Registration, licensing, and revalidation processes are dedicated to monitor the fitness to practice of health professionals mostly form professional requirement perspectives (e.g., knowledge, skills, experience, etc. ); additionally, these procedures are completed with periodical health status examination of physical fitness to practice for occupational safety to assure safe and healthy working conditions (Merkur et al. 2008; Solé et al. 2014). Occupational health examinations evaluate and monitor health status and working ability of professionals and intend to protect from health and safety hazards at work and to prevent work-related injuries and disease. This preventive healthcare service includes general medical examination, family and personal history, identification of health hazards at work, and changes in the health status. Unfortunately, this examination is not yet widely used for mental health prevention and psychological harm reduction of professionals. Still, including mental health prevention to the periodic occupational health examinations and incorporating mental health promoting measures, trainings to licensing and revalidation processes could be beneficial for the HWF development in the long run. The most prominent representative of this field Engel introduced the biopsychosocial (BPS) model in 1977 (Engel 1977) and noted that the biomedical model focusing on diseases and bodies is no longer adequate. 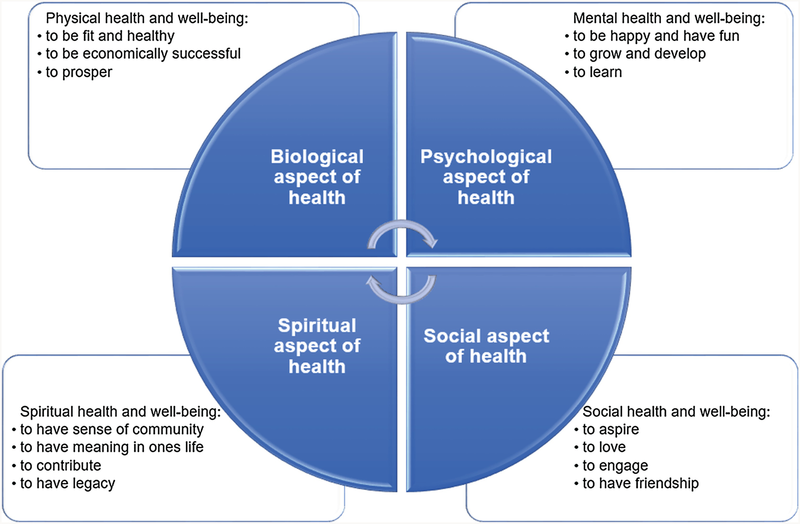 This model was expanded with spiritual aspects of health (Fig. 3). Understanding diseases to be treated more efficiently the social and psychological components of diseases should be taken equally into account. Engel argues that individuals and disorders are socially defined and are existing in a larger social milieu (Bishop 2009; Engel 1977). Therefore “the style” of caregiving is culturally as well as economically embedded (Bishop 2009). So BPS model can be interpreted as an approach to describing and explaining how biological, psychological, and social factors combine and interact to influence physical and mental health. First McKee and Chappel in 1992 proposed to integrate spirituality into caregiving as spirituality has positive impacts on patient health and behavior (McKee and Chappel 1992). People have diverse interpretations of the term spiritual, which is an open concept in current literature. To explore the spiritual dimension of all meanings, see the work of Saad et al. (2017). Spirituality often refers to an individual’s or a group’s relationship with the transcendent, or their intention to search for transcendent meanings (Sulmasy 2002). The acceptance of the biopsychosocial-spiritual framework was strengthened by Piedmont’s work on spiritual transcendence, when spirituality and transcendence was added to the Big Five personality model as the sixth factor. Piedmont argues that spirituality is a basic element of human beings (Piedmont and Leach 2002), and he emphasizes the human desire to find meaning in life. Sulmasy (2002) also emphasizes the need for a model and further practice that broadens the biopsychosocial model with the spiritual concerns of patients. As the patient exists within interpersonal relationships, illness can be considered as a disruption in biological relationships that affects all the other relational aspects of a person (Sulmasy 2002). Illnesses disturb the relationships inside and outside the body of the patient and has a significant influence on the biochemical processes inside and on the environmental processes outside. Therefore, it might influence the relationship between the patient and the transcendent, spiritual entity. The biological, psychological, sociological, and spiritual dimensions of health are equally important to our well-being (see Fig. 3). There is an urgent need for incorporating the holistic or biopsychsocial-spiritual approach not only in patient care setting but also in health education and health promotion settings. In the last couple of decades, medicine has recognized that spirituality and religious values shape the way of thinking about diseases and meaning of life (Bishop 2009). According to the biopsychosocial-spiritual model, it is highly necessary to incorporate nonphysical outcomes into national and local health objectives, such as in case of chronical diseases, spirituality has an enormous effect on well-being. Therefore, the holistic approach of healing (healing the body, mind, and also the spirit of the individual) has become more popular and prominent. All the human “subparts” are in a constant interaction with the surrounding environment. Thus during an anamnesis, not just the medical history but also the spiritual history could be taken into account (e.g., see the FICA method of taking spiritual history by Puchalski 2001). Additionally, some evidences suggest that daily spiritual experiences might mitigate physical, cognitive, and emotional forms of burnout in the workplace (Holland and Neimeyer 2005). Health professionals are at high risk of belonging to vulnerable groups prone to burnout, since they are often overloaded physically and emotionally (Gyorffy and Girasek 2015; West and Shanafelt 2007a, b). This vulnerability could result in negative consequences in terms of caregiving, e.g., lack of empathy of the health workforce or difficulties in compassion and in communicating with patients, families, and colleagues (Hegedus 2000; Hegedus et al. 2004; Kegye et al. 2015). The work stress-related somatic and psychological vulnerability of health professionals (physicians, nurses, and resident doctors) was mapped in several previous studies (Adam et al. 2008; Dyrbye et al. 2006; Kovacs et al. 2010a, b; Papathanasiou et al. 2011; Piko 2006). These studies emphasized the high prevalence of physical and psychological symptoms occurring as a result of chronic stress (Adam et al. 2008; Stanton and Randal 2011). Chronic stress damages people day after day, year after year. People might get used to the continuous stress and tend to forget to manage it, and to cope with it. Chronic stressors are of relatively longer duration and can result in serious health risks due to their prolonged activation of the body’s stress response (Kovacs et al. 2012). Burnout as a phenomenon has grown from a specialized occupational hazard to a pervasive workplace hazard in the last four decades. Burnout syndrome consisting of emotional exhaustion, depersonalization, and reduced personal accomplishment is known to frequently occur in people-oriented and service-centered work (Maslach 2001; Maslach et al. 2001). Emotional exhaustion refers to feelings of being depleted of one’s emotional resources. Nyatanga (2014) refers to emotional exhaustion as the central and often the most obvious manifestation of the syndrome (Nyatanga 2014). Depersonalization is a negative and cynical attitude and behavior towards patients. Finally, reduced personal accomplishment covers the decline in one’s own competence and self-efficacy in the self-perception. Job burnout is underlined as a social phenomenon influenced by interpersonal relationships in the work environment. Physicians and nurses tend to make increased emotional investments when working with ill people, especially emotionally demanding relationships with patients have been considered as the root to burnout, by causing heavy psychological burden on HWF as well as leading to emotional exhaustion (Maslach et al. 2001). Health professionals serve patients who are usually in a state of vulnerability or crisis, having daily face-to-face work with usually demanding and needy clients (Kumar 2016).These could cause an elevated load of stress and emotional challenge in the interpersonal exchange (Lizano 2015). Establishing an empathic connection between health professionals and patients is a cornerstone of patient-centered care. In addition to individual costs (e.g., somatization, diminished well-being), burnout is associated with organizational costs (e.g., absenteeism, turnover, lower performance) that can interfere with health care provision. Therefore, health professionals’ burnout can be interpreted as an important indicator of the operation and effectiveness of healthcare settings and systems. In the new millennium, a significant change emerged in burnout research, namely, burnout syndrome was rephrased as an erosion of engagement with the job and underlining the management of human capital in modern organizations (Schaufeli et al. 2009). Psychological burnout poses a risk to the psychological, physiological, and behavioral well-being of professionals, since it affects the whole personality. According to the holistic health concept, job burnout concerns physical, intellectual, emotional, social, and spiritual health of professionals. At the physical level, poor physical health (e.g., strain, low immunity, sleep disturbances, fatigue, and psychosomatic symptoms) is found in connection with burnout, while depression, anxiety, irritability, hopelessness, and doubt are potential emotional symptoms of burnout syndrome. Draining from energy has far-reaching negative consequences in social life of professionals: detaching oneself from his or her family, friends, patients, and colleagues, having difficulties to spend time with others, thus professionals tend to isolate themselves. While, cognitive weariness, low personal accomplishment, low self-esteem can be related to intellectual health. Finally, decreased or lack of meaning of work as well as the inability to connect with others and searching for wholeness within yourself can be defined as the spiritual aspects of health in burnout. Meaningless work is often associated with existential burnout, apathy, and detachment from one’s work within occupational psychology, management, and career literature (Lips-Wiersma and Wright 2012). Job-related burnout could result in making poor judgements, errors, hostile behavior, decreased level of commitment, or disruptive relationships with colleagues (Kumar 2016). It is worth to consider and decide which aspects of the biological, psychological, social, and spiritual domains are most important to understanding and promoting mental health of health care workers and providing a multidimensional treatment for burnout. This complexity has potentially far-reaching implications for wider human resources management and workforce planning. Genuinely, holistic health care must address the totality of the patient’s relational existence (Saad et al. 2017). Schaufeli et al. (2009) claimed that burnout is a global phenomenon; however, burnout research seems to have spread corresponding with the economic development of the countries involved. Authors suggest that globalization, privatization, and liberalization caused rapid changes in modern working life, such as increasing demands of learning new skills, the need to adopt new types of work, urging higher productivity and quality of work, time pressure and hectic jobs, which may produce burnout (Schaufeli et al. 2009). Health is a state of complete physical, mental, and social well-being and not merely the “absence of disease” or infirmity (Larson 1996). The ability to adapt and self-manage when facing social, physical, and emotional challenges is inevitable. Mental health for health workforce can be conceptualized as the ability to be empathic with patients as well as staying open to (the world of) patients. Health care professional with appropriate mental health realizes his or her own potential to cope with work stress, works productively and fruitfully, knows his or her professional fitness to practice, competency, aims to develop his or her self-knowledge, and is also able to contribute to the community. The level of burnout measured by the Maslach Burnout Inventory consists of three subscales: emotional exhaustion, depersonalization, and low sense of personal accomplishment (Wei et al. 2017). Burnout showed significant levels among health professionals (Lemaire and Wallace 2017); however, estimating its global prevalence and its volume among health professionals is rather challenging as values might vary between countries, specialties, sectors, and across time, as well as according to the dimension of burnout (Shanafelt et al. 2015). Despite all the variation, it is postulated that the level of burnout among health professionals, particularly among medical doctors, is increasing sharply and could be considered as epidemic (Lemaire and Wallace 2017). Psychological burnout has most often been studied in caregiving professionals, such as clinicians, psychologists, social workers, and nurses (Demir et al. 2003; Kovacs et al. 2010a; Schmitz et al. 2000; Shirom et al. 2006). Prevalence of burnout in western countries in the EU within the general working population ranges from 13% to 27% (Gyorffy and Girasek 2015; Wilkinson et al. 2017), while 70% of physicians and 30%–50% of nurses reaching clinical levels of burnout on self-reported measures (Lamothe et al. 2014). Aiken et al. (2002) focused on studying nurses and found that more than 40% of hospital staff nurses score in the high range for job-related burnout, and more than 1 in 5 hospital staff nurses say they intend to leave their hospital jobs within 1 year (Aiken et al. 2002). Burnout is considered to be a work-related hazard, being prevalent among individuals working in the field of human services (Lemaire and Wallace 2017). By the nature of their work, health professionals need to face regularly and are permanently exposed to an enormous amount and wide spectrum of emotions, such as frustration, feeling powerlessness against illness, fear, guilt, or trying to keep distance from patients (Meier et al. 2001). Being constantly exposed to emotions inevitably results in stress or burnout (Kumar 2016). Thus we must underline that health professionals belong to one of the most vulnerable groups in terms of experiencing burnout during the life course. In addition, their professional responsibility of “doing their best” attitude (Lee et al. 2015; Maslach and Leiter 2017) certainly increases their vulnerability. According to Shanafelt and Noseworthy, organizations and practice environment play critical roles in whether physicians remain engaged or burnout (Shanafelt et al. 2015; Shanafelt and Noseworthy 2017). Engagement is the positive antithesis of burnout and is characterized by vigor, dedication, and absorption at work. First, Maslach and Leiter (1997) developed a new model proposing six areas of job-person mismatch, six areas of worklife (workload, control, reward, community, fairness, and values) which are the critical sources of burnout, and then they developed a tool to assess the abovementioned areas, which can be used as part of a program of organizational assessment and intervention (Leiter and Maslach 2004; Lee et al. 2015; Maslach and Leiter 2017). Work-related or organizational factors contributing to burnout and engagement can be grouped into seven dimensions: workload, efficiency, flexibility/control over work, work-life integration, alignment of individual and organizational values, social support/community at work, and the degree of meaning derived from work (Shanafelt et al. 2015; Shanafelt and Noseworthy 2017). These seven dimensions of work-related factors contributing to burnout have been well researched during the past four decades of burnout literature (e.g., Adam et al. 2008; Buunk and Schaufeli 1993; Demir et al. 2003; Greenglass et al. 2001; Maslach et al. 2001; Schmitz et al. 2000; Shanafelt 2009; Shanafelt et al. 2015; Shirom et al. 2006; Troppmann and Troppmann 2012). Edelwich and Brodsky identified four stages of burnout (disillusionment) as enthusiasm, stagnation, frustration, and apathy (Brodsky 1980). Stage of enthusiasm can be described as full of large positive and mostly unrealistic, idealistic expectations, promises of health professionals. In this stage, ideas and plans, motivation and willingness show high levels and acting rapidly occurs on a daily base. The intrinsic needs of health professionals are rather hidden. During the stage of stagnation, the initial enthusiasm is fading. Work becomes routine, so professionals are able to manage everything easily. The previous enthusiasm and increased activity level diminishes and reduces significantly. In this stage, negative experiences might appear more often. Professionals are completely aware of their own private needs (while work-life balance often gets into conflicts) and therefore only decreased amount of time is dedicated for caring patients (Fenwick et al. 2018). In the stage of frustration, problems become more frequent, particularly connected to work and private life imbalances. Conflicts with patients, colleagues, and the management multiply. Professionals tend to raise questions regarding efficiency and meaning of work. At the end of frustration phase, there comes the apathy, when professionals lose their initial motivation. Vision, enthusiasm, and willingness are declining significantly and getting the financial assets remains the only one motivating factor. Health professionals in apathy tend to do only routine tasks and they reject new tasks or request for overtime. The final phase of the syndrome is burnout itself. Burnout covers lack of meaning in work and lack of meaning in life. In this last period, the emotional exhaustion, depersonalization, and inefficiency shows significant levels. Psychologists tend to describe burnout as a continuous phenomenon, whereas those with a medical background tend to detect burnout dichotomously (Schaufeli et al. 2009). If we grasp burnout as a form of chronic distress that results from a highly stressful and frustrating work environment, we can recognize different intervention possibilities targeting different stages of burnout. In the phase of enthusiasm, realistic expectations and purposes should be conceived. Professionals should be encouraged to define feasible and sustainable goals of their work. Trainings, facilitation of building new skills, and mobilization can be effective when stagnation is present. Professionals should find opportunities for appropriate continuous professional development (CPD), and it would be particularly beneficial to obtain education related to psychology-mental health and trainings that focus on health promotion, well-being of professionals. Attention has to be drawn to the positive aspects of the work for health professionals in stage of frustration and also relief of the quelled energy can be helpful for those battling with frustration. Professionals should find the ways to cope with the chronic frustration and challenges. When someone moves into apathy phase, a new realistic involvement is needed (Hegedus 2000). Professionals should receive remarkable support in rephrasing themselves. One of the main focuses nowadays in modern organizations involves the management of human capital. Organizations need engaged and loyal employees being motivated, proactive, responsible, and involved. Frequently, the organizations’ burnout prevention is replaced by promotion of work engagement and resilience (Back et al. 2016; Schaufeli et al. 2009). This approach fits positively into the health promotion concept by up-scaling competency, strengthening teams and not correcting weaknesses. This proactive prevention approach engages individuals and systems in a growing mindset. Ybema et al.’s (2011) longitudinal three-wave study also showed that a strong focus on this health concept in the organization can lead to more enhanced job satisfaction, reduced burnout, and reduced sickness absence (Ybema et al. 2011). The main challenge in burnout prevention and intervention derives from multiple research evidence regarding individual and work-related factors and sources connecting to job burnout. Individual factors cover personality traits such as neuroticism, type D personality, low extraversion, negative affectivity, locus of control, self-efficacy, emotional intelligence, and lack of adaptive coping. In terms of individual sources of burnout, current research suggests that professionals-related burnout could be also the result of the “hidden curriculum,” such as embracing maladaptive behaviors from the professors or because of inadequate leadership and supervision (Dyrbye and Shanafelt 2016). This issue might lead us to the emerging phenomenon of student burnout, maladaptive socialization patterns, and lack of effective management. Work-related variables of burnout could be among others: high workload, role conflict and ambiguity, low predictability, lack of participation in work and social-related activities, low level of self-reported social support, and experienced unfairness. Organizational sources of burnout can be derived from the nonsupportive working environment. Health professionals need to constantly “do their best” under enormous pressure in a so-called unforgiving environment. Additionally, they have exceptional bureaucratic burdens and need to keep going with the continuous changes and innovation (Kumar 2016). Research evidence broadens the common knowledge on understanding burnout and identifying risk factors on the one hand, but it also affects elaboration of burnout prevention and intervention programs on the other hand, as there is no consensus on the way how to treat it. Currently available interventions are almost entirely single-arm pre-post studies, and many lack the evidence to indicate efficacy in improving well-being, creating behavioral changes in clinical practice, or reductions in burnout (Back et al. 2016). Based on the available research evidence, there is a definite need for interventions targeted at individual and at organizational work-related factors. Previous research suggested that combining individual and organizational approaches have potentially longer lasting effects on decreasing the level of burnout. Nevertheless, interventions so far have been mainly focusing on individual characteristics and neglecting organizational aspects (Doré et al. 2017). At individual level facilitating relaxation, self-improvement, self-knowledge, exercise, resilience, providing supervision and peer-group sessions can help in combating burnout. Mindfulness training, stress reduction techniques, and self-education can significantly support individuals in reducing the likelihood of burnout (Panagioti et al. 2017). Using stages of burnout and biopsychsocio-spiritual model (accepting disturbances in relations can occur either aspects of health – physical, emotional, intellectual, social or spiritual) as frameworks for building burnout intervention programs would be highly supportive. In general, through work-stress-management programs, stress-related problems can be decreased by offering better working conditions. This can be good option for reducing chronic stress and psychological burnout at organizational level. Indeed, it must be noted that various service organizations significantly differ according to their unique work contexts. In order to circumvent job stress, managers and administrators can design tasks with clear responsibilities and expectations to the workers. To effectively communicate expectations, precise job descriptions and organizing regular staff-meetings can be beneficial. Important tool for organizations in the healthcare system is to provide various and appropriate resources (e.g., emotional resources in the form of social support and instrumental tools) to target relieving emotional exhaustion in the workforce. Additionally, adapting effective leadership tools has the ability to positively influence and support a healthy working environment (Jimenez et al. 2017), and a dedicated leader has the power to show competence and support, motivate employees, as well as is aware of the potential of empathy (Cummings et al. 2018). Ensuring set of resources can mean a key strategy to the protection of the well-being of the workforce (Lizano 2015). This can be facilitated at organizational level and macro-level health policy by providing system-level support. There is an increasing amount of literature concerning burnout among medical employees; however, little attention has been dedicated to the intervention and prevention strategies especially, on global policy level (Henry 2014; Magtibay et al. 2017; Noben et al. 2015; West et al. 2018). Burnout syndrome affects both physical and psychological factors of the individual, just as its consequences appear on both levels, and therefore burnout intervention should be based on holistic approaches. Identifying and appointing the risk factors of burnout is key and crucial step to set prevention and intervention strategies. As indicated above, risk factors can be determined based on personal characteristics or according to working and professional conditions or work units, organizational and national factors (Jimenez et al. 2017; Shanafelt et al. 2015; Shanafelt and Noseworthy 2017). When considering and sustaining the national healthcare system, policy makers require a high amount of information to build up their strategy for managing a resilient HWF. In the EU, health belongs to national competency; therefore, national level decision-makers establish processes and regulations. Political commitment is inevitable to implement a HWF strategy and initiate health policy interventions and actions (Kovacs et al. 2016). Political commitment is one of the essential factors in planning, and thus the engagement of health policy and decision-makers is necessary in order to implement and realize influential actions and effective interventions. Most of the times, HWF issues only come into the center of the attention of decision-makers, when a significant imbalance or shortage of professionals appears and it risks the sustainability of caregiving. Notwithstanding, national health governance should keep HWF issues among its top priorities and continuously monitor and improve the situation, and be responsive. 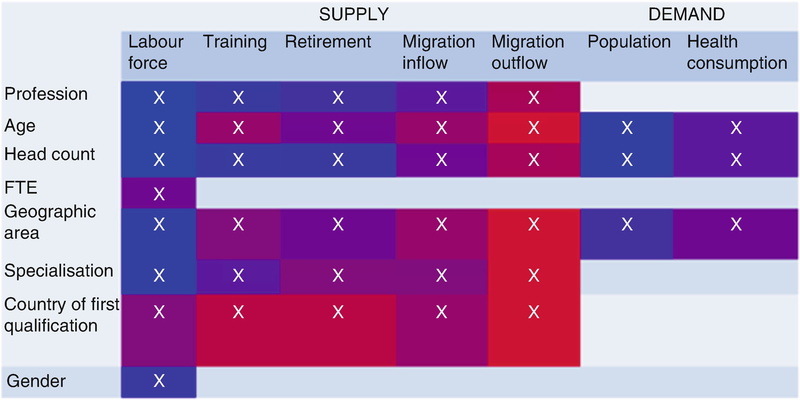 Several studies underlined the general importance and benefits of HWF planning, which means planning-monitoring and forecasting exercises should be in place whether or not a healthcare system recognizes problems in terms of HWF shortage or uneven distribution (Kovacs et al. 2016). Regional level plays also a significant role in countries, where geographical fragmentation within a country exists: some countries in Europe have fragmented systems, e.g., Italy, Spain, Austria, Germany, etc. These countries have different systems and governance. Most of the times, regional level has its own authority in managing healthcare, but meanwhile there is a national level coordination. To implement harmonized international and national level standards is the responsibility of national level health workforce governance. In the development and planning processes, we distinguish the supply and the demand side of the system; however, they work in strong interrelation. Health policy needs to tackle both parts, namely, a continuous monitoring of the stock and flow numbers of the HWF in the supply side and population demands, mortality, and morbidity rates and costs among the demand side’s components. As Fig. 4 shows, HWF planning shall lead to better health outcomes of the population. This complexity of the action framework already causes several challenges for health policy and workforce planners. Additionally, the lack of .health policy dialogues on the well-being of HWF makes health workforce planning even more difficult. Thus it can be concluded the HWF planning can be hardly utilized effectively without incorporating the well-being of HWF research into discussions. Among critical success factors of HWF development, we shall emphasize that only a healthy HWF can be efficiently planned. HWF monitoring as a basic HWF planning activity involves carrying out regular environmental scans and evaluations, and viewing HWF trends retrospectively. HWF monitoring performs analysis on the current situation and aims to respond to the challenges posed by the current situation (Diallo et al. 2003). HWF forecasting occurs when HWF monitoring is needed to reinforce projections for the future. HWF forecasting predicts the required HWF to meet future health service requirements and develops strategies to meet those requirements. Finally, HWF planning refers to complex, more developed activities including interventions on influencing the supply. In summary, HWF planning ensures that the right number and type of health human resources are available to deliver the right services to the right people at the right time (Dussault et al. 2010; Fellows and Edwards 2014; Kolars 2001; Malgieri et al. 2015; OECD 2008, 2016; Ono et al. 2013; Roberfroid et al. 2009). Previous research showed the evidence that from the abovementioned processes, HWF monitoring is the most frequent activity, followed by planning and forecasting. HWF monitoring among the five sectoral health professions is used most frequently in the EU MS. Countries indicate that they monitor medical doctors, nursing, and midwifery workforces, while workforce forecasting and planning activities are the most frequent in the profession of medical doctors (Kovacs et al. 2016). Therefore, monitoring activities of medical doctors are considered to be well-developed. In the EU, different levels, stages and actions taken in HWF planning was observed, and experts distinguished countries/country clusters according to the stage of HWF planning development. The so-called “HWF planning development continuum” refers to the distribution, sequence of countries that achieve various levels in systematic actions. One end of the continuum starts with the nonsystematic or partially systematic use of elements in HWF monitoring, forecasting, and planning with ongoing actions, by also focusing on databases and data collections in different countries. These elements usually tend to be further developed towards systematic, proper, and comprehensive HWF planning. Many countries make the effort to initiate and realize systematic HWF planning by implementing projects, interventions, and tangible steps (e.g., Iceland, Hungary, Poland, Italy, Portugal, Slovakia, and Greece). On the other end of the continuum, we can observe countries that possess established systematic HWF planning systems (e.g., Belgium, Finland, and the Netherlands). Naturally, each phase of the continuum could be developed further through careful assessment, continuous evaluation, and improvement of HWF planning on a regular basis. Usually these systems utilize a wider dataset for planning and establish data warehouses by data source linking. The current literature of the JA EUHWF summarized system features, main elements of systematic, advanced level, and comprehensive HWF planning (Kovacs et al. 2016; Malgieri et al. 2015). These components are crucial for HWF planning activities and require continuous revision and development. To enable HWF planning developments, the JA EUHWF established five key elements in HWF planning systems that cover the essential system features: goals, organization, data set, forecasting model, and link to policy (Fig. 5). Additionally a “Toolkit on Health Workforce Planning” (http://hwftoolkit.semmwleis.hu) was also designed, in which tools were collected to provide directions for achievable and manageable solutions that foster the development and support the daily operation of HWF planning. Figure 5 shows that among essential system features, we highlight the extended attention to and awareness of the topic of HWF planning at the policy/political level. Decision-makers should keep HWF development in the political agenda. In addition, HWF development should also have an added goal: strengthening resiliency of health systems and HWF, as well as incorporating health promotion of the HWF into dialogues of development. Setting up explicit goals and commitment to the goals is necessary to clarify the strategy for health system strengthening. HWF can be developed efficiently only if the HWF is healthy. It is also important to monitor the environment, because unexpected factors might emerge in planning. For example, Brexit or the earlier economic crisis in 2008 had an impact on original planning in several countries. Unexpected events influence HWF planning, because policy needs to be responsive and tailor the interventions to the suddenly emerging needs. For example, the impact of the economic crisis was very significant in Iceland. Health professionals used to go abroad for specialization trainings previously as well, but in the years of the financial crisis, they started not returning but leaving the country for longer time to earn higher salaries. Naturally, this trend caused problems in the domestic healthcare system (Kovacs et al. 2016). Brexit is also an important process to modify original planning. When Brexit was announced, the number of new entering foreign nurses to the UK dropped significantly, and professionals got uncertain of their future. The healthcare system in the UK is highly reliant on foreign professionals, since approximately 30% of their workforce has a foreign background (Aszalós et al. 2016). Policy makers recognized this issue and quickly addressed it by announcing to open 1500 new medical student university places. Obviously, it is an important step, but it is very challenging to replace a significant shortage of specialist doctors in a short time frame – because 10–15 years of training is needed to educate a specialist doctor. A dedicated group with high-level stakeholder involvement and commitment to HWF planning is required to manage national or regional planning. It is beneficial to incorporate the knowledge of mental hygiene of the HWF into the human resources management even at macro-level. A proper and adequate communication flow to acknowledge the latest data and information, support of online platforms, IT solutions, or health information system supporting data collections and information flow are crucial. This could provide clarity of the current country situation, updated situation analysis to be conducted, while data source linking could support avoiding duplications in data collections. Mostly individual (not solely aggregated), but anonymous datasets support health governance in evidence-based policy making, and implementations linked to policy actions could enhance data on mental health and well-being of the HWF. Several EU countries have developed e-health systems, but digital maturity and e-health usage shows high variety in the EU. Technological growth impacts on digital workflow, computerized knowledge management, and decision support. For instance, in HWF planning a common platform for HWF planning – with harmonized methods, data and models – in the EU could strongly support the optimized planning processes, where planners could jointly calculate and estimate numbers of health professionals not only for a separate MS but for the whole EU. Digital transformation with its beneficial feature of supporting administration and management, and an automated data exchange platform could envisage the future trends and support policy making by providing real-time evidence for interventions. Doubtlessly, planning processes and planning data need to be studied together, due to their mutual close connection and interdependency, both have a significant influence on data quality and systematic HWF planning activities. Policy and decision-makers establish development strategies for strengthening health system sustainability. Not surprisingly, evidence-based, evidence-informed, or data-driven health policy require data. Implementing actions and interventions and strategic planning need exact inputs describing the retrospective trends and the current situation, as well as anticipating the future. Valid information that includes quantitative and qualitative data on HWF is crucial for health policies to manage health care appropriately in a changing environment. Furthermore, reliable data on HWF should be collected and examined to analyze trends and make projections (Kovacs et al. 2017). Improving the timeliness, availability, accessibility, accuracy, validity, reliability, coherence, consistency, and comprehensiveness of HWF data and datasets also plays a crucial role in achieving a sustainable HWF. HWF data collection, monitoring, planning, and formulating of projections is a matter of national competence in EU countries, but global and European guidelines, recommendations, and action plans exist to support countries in this field (WHO 2010, 2016a). The international scope requires harmonization and transparency to conduct solid comparisons and track the wider perspective. Data collection, including data content, sources, and categories, can differ significantly between countries – even from the same region – based on national traditions and practice. Therefore, national planning models utilize separate indicators or data coverage and follow different processes. Since HWF cannot be handled in isolation solely at the national level, international monitoring would be beneficial; this is also a prerequisite for reliable comparison of HWF-related information and knowledge exchange between countries. The most important national HWF data source might be a registry of health professionals that summarize the numbers of professionals registered and licensed to practice in a given country. Registries in general show the number of new entrants and stock data by professions and subsectors, often including headcounts and sometimes full-time equivalents. Nevertheless, although registry data are considered to be a valid and reliable source, data categories and calculation methods can follow diverse formulas (Girasek et al. 2016). Minimum datasets and planning models summarize the minimum data content required to HWF planning and several calculation methods leading to diverse scenarios of the future (Birch et al. 2013). The JA EUHWF collected good practices on HWF planning systems in the EU (Malgieri et al. 2015) and presented key elements that function well in the selected MS. Obviously, health care systems differ significantly in the EU, but countries can learn from good examples (Batenburg 2015). 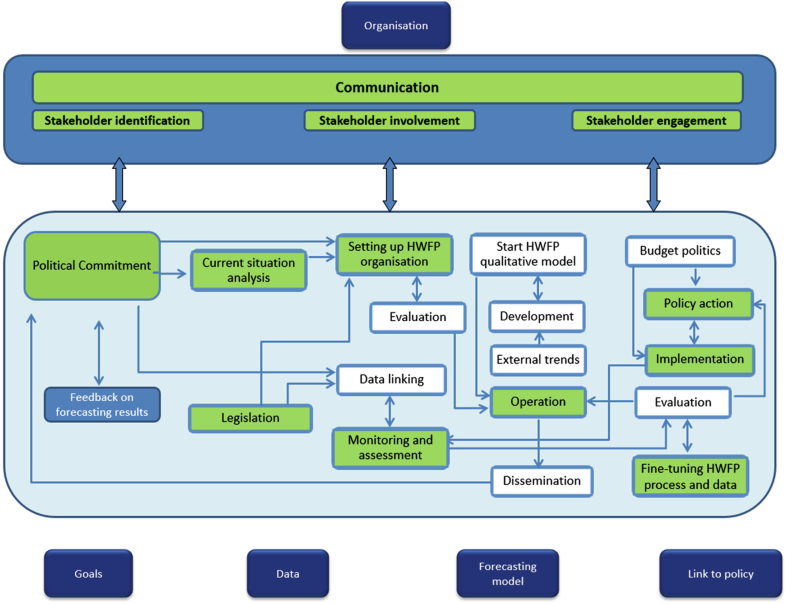 The minimum dataset for HWF planning was established channelling the good practices into one minimum planning data requirement table (Michelutti et al. 2014). The minimum dataset (MDS) points out the data to be collected at national level on the supply and demand side in order to carry out HWF monitoring, forecasting, and planning (Fig. 6). The data areas and dimensions mainly focus on the composition of the workforce (e.g., stock and flow numbers, estimated in- and outflow), not including any indicator on HWF resiliency or well-being data. The overall objective for HWF planning activities is to collect and monitor the basic data categories that enable estimating the future need of the population and the future supply of the HWF. Health policy interventions could be implemented based on the different future scenarios. This could be further developed by adding additional data and indicators monitoring the HWF resiliency. The first-level objective of HWF planning is the inventory of stock and the related objective is the replacement of the current domestic HWF (Kovacs et al. 2016). The second-level objective of HWF planning is the identification of imbalances between the existing stock of health professionals (current imbalance), the projection of stock (future imbalance), and the consumption forecast (current and future demand and whether it is resulting in imbalances) in the future. The third-level objectives of HWF planning includes the complete variation of the stock as measured and converted into potential service through the application of real full-time equivalent (FTE)2 taking into account the gender and the mobility of the HWF. Demand calculation remains simplified as in the previous level (population age, headcount, and geographical area, optimally combined with health consumption). Previous research showed that HWF data availability, reliability, validity, and comparability are hard to achieve, since huge gaps and diversity in understanding and interpretation can be experienced when focusing on the required data content. Some countries (including Finland, Belgium, the Netherlands) have a clear understanding of the stock – health professionals licensed, professionally active or practicing in the field – even having a detailed breakdown of full-time equivalents (FTEs), while other countries can only draw on headcount numbers, sometimes aggregated solely for certain groups of health professionals. Although the evidence on the minimum data requirements for planning is available and international level clarification of data categories has been ongoing for a long time, it still takes time for national and/or regional level decision-makers to recognize the benefits for a long time run and to match MDS to their local data collections. We can see that data collections and building a data warehouse with appropriate data content for HWF planning is rather challenging in several countries. However, no consideration is yet included into the HWF planning on the well-being of the HWF. Among the outflow indicators of the supply-side data repository, morbidity rates or prevalence of mental health-related problems influencing drop-out rates could be also involved. Several recent trends tend to alter healthcare systems. First of all, epidemiology is changing in ageing societies (Cooper et al. 2002). Treating single diseases is no more accurate for the HWF, since numbers of over 65 s with two or more diseases is continuously rising (Kingston et al. 2018). Healthcare systems and HWF need to cope with the rise of multimorbidity and chronic conditions, while managing complex multimorbidity in a complex working environment. New care patterns and care models achieve greater significance in healthcare delivery, such as long-term care, where treatment pathways and professional-patient relationships show new patterns. Latest discussions underline the importance and greater focus on prevention, maximizing the contribution of public HWF in population’s health (Sim et al. 2007). In addition, not only the population but the HWF is ageing, therefore dealing with the mental health prevention among health professionals should also be an important policy goal. The second most remarkable challenge is the mobility and the increasing migration of the HWF that might result in imbalances of the HWF distribution at international and national levels (Aszalós et al. 2016; Buchan et al. 2014). Countries, especially within the EU, cannot be handled in isolation. The free movement of professionals is enabled and facilitated in the EU. Professionals and patients are free to move and provide or access care in EU MS. From this phenomenon, research findings strengthened the increasing volume of South-North, East-West, and cross-border movements of health professionals (see more detailed in the projects: Mobility of Health Professionals (Tjadens et al. 2013), Health Prometheus (Buchan et al. 2014; Wismar et al. 2011), RN4Cast (Sermeus et al. 2011), and Migración de Profesionales de la Salud http://mpdc.es). Medical doctors and nurses seem to be the most mobile professions, and therefore, harmonization of requirements, trainings, clinical guidelines, and scope of practice, etc. is crucial. Another challenge, healthcare is facing is the digitalization. Health information technology, e-health and m-health, enable HWF to maximize care delivery. New technology, innovative solutions might support care provision and HWF itself (Lapao and Dussault 2017). However, digital transformation in healthcare requires digital upskilling of the HWF, therefore development and advancement of the digital skills, e-skills is essential for today’s and tomorrow’s HWF and care provision (OECD 2018). Digital literacy of HWF and health literacy of the population requires empowerment, health technology assessment, health information systems, and e/m-health could enable development of these areas. All the listed challenges influence the daily scope of practice of health professionals and might cause severe stress and chronic stress. The EU and global agenda initiated to emphasize strategies for effective, accessible, and resilient health systems (World Health Organization Regional Office for Europe 2017). Resilient health systems adapt changes, structures, and processes to provide care to and improve the health of peoples around the world. When facing the abovementioned challenges, the health systems should invest in strengthening quality (e.g., performance and health outcomes, patient safety and integration of care), strengthening HWFs themselves and support them by using new technology with the most up-to-date information. The question emerges, how can countries cope with current challenges and how can healthcare systems and HWFs be resilient? To prepare HWF for the changes, HWF education, trainings focusing on upskilling the resilient HWF can provide an answer. Several contemporary studies focus on the forecasts of future HWF skills and competences, upskilling team competences, interprofessional education, the role of soft and transversal skills in HWF education, and continuous professional development (EC 2013; Leggat 2007; Madden 2014; OECD 2018). The OECD study underlines the importance of skill-sets, among which stress and fatigue management support positive working culture (OECD 2018). Some underline the better recognition of nurses, for example, and indicate education of new skills and expanding professional roles (Maier and Aiken 2016; Tsiachristas et al. 2015). Task shifting and task sharing have been in the academic debates for few decades, and skills-mix can truly contribute to the altered daily scope of practice (Bourgeault et al. 2008). If we consider the several macro- and organizational-level challenges of healthcare systems and settings that HWF, HWF planners, managers, and decision-makers face, the highly complex processes in health policy making and strategic HWF planning can establish health policy goals and development directions, and prepare the appropriate HWF to be resilient to the frequently occurring changes. In order to cope with challenges, not only practicing health professionals but also all professionally active human resources for health need to work together, support each other in strengthening comprehensive development strategies of the healthy HWF and conducting more precise and extended planning. This homeostasis also needs to be maintained and supported on the level of the individual, namely, the health professional, as they are exposed to experience high rates of workload, stress, emotional exhaustion, cynicism, and decreased efficiency, as well as increased level of burnout and damaged mental health. Therefore, interventions should investigate the individual health professional in a holistic way like the biopsychosocial-spiritual model suggests, and strictly monitor mental health and well-being of the HWF, and finally invest into the HWF prevention and intervention programs for improved health. If the question arises “Who takes care of the carers?”, we should have a clear answer regarding the shared responsibility of different stakeholders. Burnout and damaged mental health among health professionals are among the most significant health challenges of HWF planning, as they have significant impacts on the risk of turnover, on the intention to leave, as well as could result in poor patient care outcomes, reduced level quality of care, and in increased level of sickness absence. In terms of HWF planning and burnout, the adapted ecological model can be displayed by the so-called “onion” structure representing the multiple and various layers of the environment that health professionals interact with (Bronfenbrenner, West et al. 2018). 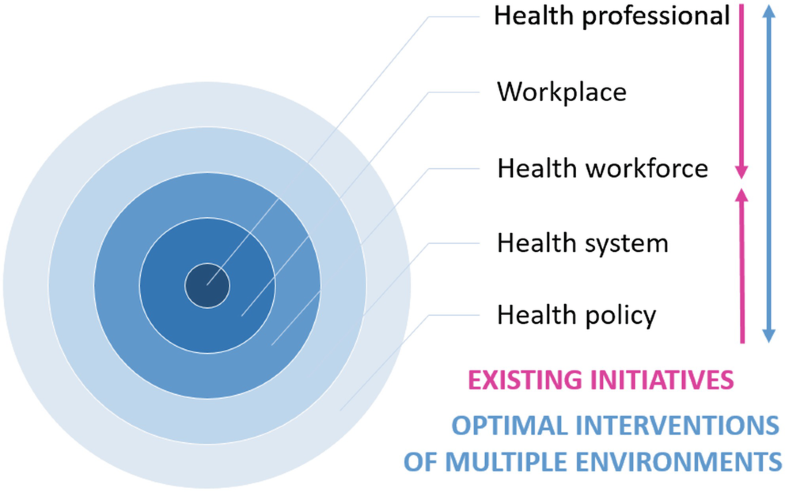 Figure 7 displays the Human Resources for Health adapted ecological model with all the important layers present in the healthcare. In the center of the Human Resources for Health based ecological model, health professionals are displayed as individuals with their personality traits, coping strategies, stress reducing skills, perceived job demands, resources and control, and own motivation for helping others. At interpersonal and organizational level, health professionals are being surrounded and affected by their workplace and co-workers (e.g., workplace characteristics, social support from co-workers, managers and leaders, styles of leadership, team working, communication, fairness, cooperation, social climate, and organizational culture). At community level, HWF is defined by professional categories and underlines the importance of belonging to certain groups (e.g., doctors, nurses, dentists, pharmacists and midwives, practicing-professionally active or licensed HWF etc.). Health policy is taken into the model at national and supranational level, governing the operation of healthcare system (e.g., imbalances of the composition of the HWF, internal and international mobility, ensuring continuity of care for all citizens and competent HWF). Nevertheless, by means of health policy, every level in the hypothesized model can and should be deliberately targeted (e.g., by designing law and regulation at national level). Additionally, health policy interventions should inevitably focus on the well-being of HWF, as upskilling and effective planning can only be realized when the HWF is healthy. To sum up and in line with the forehand mentioned, we underline the importance of the holistic homeostasis approach and the role and responsibility of multiple environments when implementing HWF development. Tangible interventions should address multiple environments in a coordinated way and take care comprehensively all layers in order to provide a sustainable and resilient HWF, and to target and plan healthy HWF. At individual level, health professionals definitely can contribute to their own improved mental health, stress and fatigue management, as well as reducing, risks of exhaustion, depersonalization, and decreased performance (OECD 2018). Supporting and empowering individuals to pay attention towards their self and own behavioral patterns can highly support the professionals in recognizing the personalized risks and hazards occurring in the work environment (e.g., experiencing disparities regarding workload, control, reward, community, fairness, and values) (Henry 2014; Leiter and Maslach 1999). Therefore, individuals should be supported to embrace their responsibility to recognize the problems (i.e., self-monitoring, consultation at the regular health status check-ups), to act on them and to stay opened and motivated to self-development and lifelong learning. Developing appropriate skills and engagement of health professionals in mental health prevention and mental hygiene are doubtlessly crucial individual strategies to be followed in order to improve well-being, self-knowledge, self-reflection, effective communication, coping, and to prevent burnout. Among person-directed interventions, we find very simple solutions, for example, a more balanced professional-patient relationship can also contribute to better well-being of professionals and therefore reduce the stress and prevent burnout (Dobler et al. 2017; Dreison et al. 2018; Henry 2014; Lacy and Chan 2018). Different approaches for treating burnout are needed at different stages of burnout, the same refers to relationship disturbances in any aspect of holistic health concept. Focus of interventions or prevention can vary, as different strategies are needed when the health professional is physically exhausted, mentally exhausted, emotionally exhausted, or when the individual already lost meaning of work or has poor social relationships and therefore poor social support. Whose job overload expands the optimal level and therefore cannot rest, should learn how to gain control over the workload, by task shifting, task substitution/delegation, reducing workload, and rescheduling shifts (Lacy and Chan 2018). Those who become cynical and frustrated during practicing, as the result of the healing nature of health professions, should be supported by their employees by providing them in stress management opportunities such as on-site counselling regular supervision, and/or staff meetings (Henry 2014; Magtibay et al. 2017). Interventions designed to change individual’s beliefs and behavioral skills are likely to work better when policies and organizations support the targeted behavior changes. Targeted intervention and prevention programs are the most powerful, when individual and organizational interventions are combined, however person-directed interventions might be more effective than organization-directed interventions at certain dimension (for example, at reducing emotional exhaustion) (Dreison et al. 2018; Panagioti et al. 2017). At organizational level, interpersonal relationships can be handled by the organizational management, healthcare management executives. Organizational strategy can promote well-being of the HWF by acknowledging the problem of burnout in the organization, harnessing the power of effective leadership, developing and implementing targeted interventions, cultivating community at work, using rewards and incentives wisely, aligning values and strengthening cultures, promoting flexibility and work-life integration, providing resources to promote resilience and self-care, and facilitating organizational science (Shanafelt and Noseworthy 2017). Therefore, at organizational level, effective strategies combating burnout should mitigate disparities, decrease the stress level of health professionals, ensure supportive work environment and workflow, create a supportive and partnership based working culture as well as effective, charismatic, and strong leadership should be realized and assured (Magtibay et al. 2017; OECD 2018). According to Lemarie and Wallace (2017), a system level approach is imperative, and therefore medical culture needs to be changed: instead of the old paternalistic relationships, effective and supportive leadership practice should be fostered to encourage and empower health professionals. In line with the abovementioned supportive attitude, prevention and promoting employees’ mental health are the most fundamental goals. Therefore, the management should be engaged in caring for HWF’s somatic and mental health ensuring financial resources for health promotion and burnout prevention activities (Dewa et al. 2014a, b; Maslach and Leiter 2017). In order to support effective leadership and organizational solution to combat HWF burnout, special managers could also be trained to organize, evaluate, and analyze HWF well-being and health promotion programs and interventions. Job training/education might be the most effective organizational intervention subtype (Dreison et al. 2018) as health promotion interventions and programs should be designed with a flexible manner in order to be able to reflect local specialties and unexpected occurrences (Panagioti et al. 2017; Ricou et al. 2018). As burnout is an end-stage, continuous monitoring of health outcomes and health status of health professionals is of a high concern. Therefore, including mental health check-ups during regular health status checks could be beneficial in keeping professionals fit to practice. How can management support employees under the different stages of the burnout process? In the phase of enthusiasm, the use of mentor or tutor in practice, knowing of the workplace’s characteristics, clear scope of activities in the work, meetings, learning goals and mission of the healthcare system at local and global level, communicating clear job demands and expectations, as well as communicating resources and opportunities covering the job can be helpful in formulating realistic expectations and purposes for health professional. In the stage of stagnation, supporting employees in participating conferences and trainings enabling scheduled rotation of unit assignments, flexibility in scheduling; skill building can reduce the risk of burnout. In the stage of frustration, attention should be drawn to the positive aspects of the work, and the existential aspects of medical profession for health professionals, healthcare managers may urge HWF to redefine the mission of the institute, to gain new values, and to make clear motivation of own. When someone reaches the apathy phase, new type of realistic involvement is inevitable: emphasizing personal resources, reducing the level of frustration, temporally reducing the number of patients to be treated, fulfilling new type of duties (such as training or research) (Dewa et al. 2014b; Noben et al. 2015; Noben et al. 2014). The well-being of health professionals should be emphasized as burnout has a strong correlation with the quality of worklife thus has crucial role in retaining HWF; also with patient safety and thus have a significant impact on optimal patient care at system level (Nowrouzi et al. 2015; Wallace et al. 2009). From the system perspective, it is also important to mention that the estimated cost of treating burnout is definitely higher than formulating mental health approach and implementing stress management programs, enhancing practice of peer groups, Balint groups, or supervision (Dewa et al. 2014a, b; Noben et al. 2014, 2015). According to current estimations, at around 18 million healthcare workers will be missing from the global healthcare system in 2030, and one million from the EU in 2020 (EC 2012b, c; World Health Organization Regional Office for Europe 2017). At macro-level, HWF governance and health policy could highly contribute to healthier HWFs and systematic and strategic planning for healthy HWF. Doubtlessly, improving health system performance is stated improving the health of population, improving the experience of care, reducing per capita costs of healthcare, and improving the work lives of health professionals and their experience of providing care belongs to health policy priorities (West et al. 2018). Decision-makers in health policy should keep HWF development in the political agenda (Kovacs et al. 2016), setting up explicit goals promoting mental health and commitment to the goals are necessary to clarify the strategies for strengthening mental health of HWF as well as supporting planning and elaborating good practices in the field The following documents have already underlined the prioritization of mental health at workplaces: Green Paper for Mental Health 2005, the European Pact for Mental Health and Well-being 2008, the WHO Mental Health Action Plan 2013, the Joint Action on Mental Health and Wellbeing 2013–2016, European Framework for Action on Mental Health and Wellbeing 2016, and EU-Compass for Action on Mental Health and Wellbeing 2015–2018; however, strategic actions particularly in HWF planning are rarely implemented. Studies of workplace engagement indicate that system-level factors clearly influence burnout, which means that leaders in healthcare systems need to understand how their decisions influence turnover, absenteeism, performance, and ultimately patient and family outcomes at the institutional level. 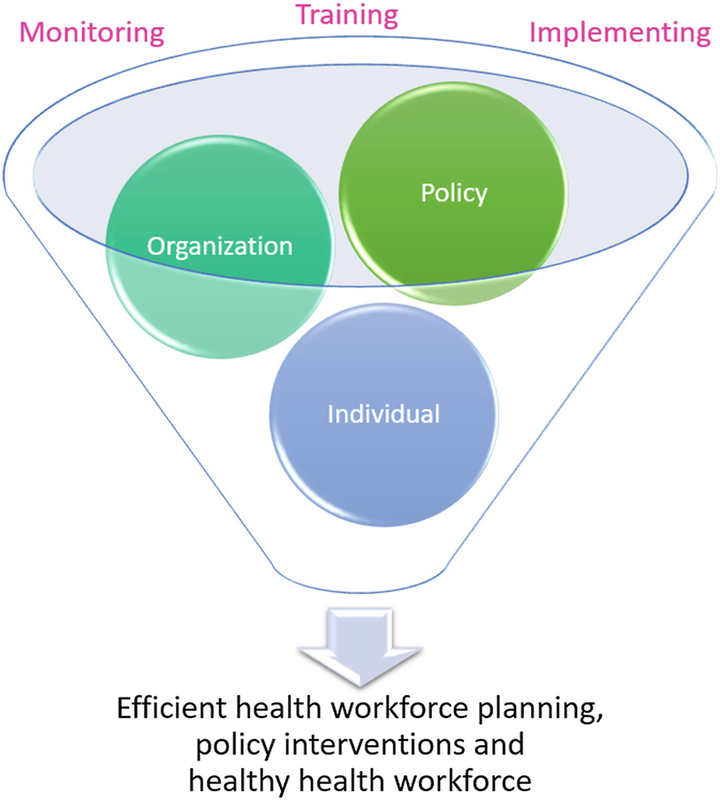 To achieve health policy goals of creating a sustainable, resilient, and healthy HWF, and monitor system-level factors, planning processes, action frameworks, projection models, and minimum datasets should consider mental health and well-being characteristics, and enhance HWF development and planning framework with the core variable set on mental health and well-being. For instance, supply-side data repository for HWF planning should incorporate data on morbidity rates or prevalence of mental health-related problems influencing dropout rates, or indicators on HWF resiliency. Automated data exchange with e-health platform support could envisage the future trends and support policy making in this matter. The complexity of HWF planning processes is already facing tremendous challenges; however, effective planning in the long time run requires evidence-based policy actions. Interventions could only be implemented effectively if HWF does not declare poor health. In case of chronic stress and burnout, people could perceive decreased productivity, job dissatisfaction, higher intention to leave clinical practice, mental fatigue which could result in increased level of medical errors and malpractice claims, and thus indirectly could increase the costs accumulated in healthcare (West et al. 2018). To mitigate the risks of malpractice and medical errors, health policy should also consider to incorporate mental health checks into regular occupational health examinations to provide mental health prevention, monitoring, and psychological harm reduction of professionals (Askey-Jones 2018). Including mental health prevention to the periodic occupational health examinations and incorporating mental health promoting measures, under- or postgraduate trainings to licensing and revalidation processes could be beneficial for the HWF development in the long run. Therefore, to raise the awareness of policy makers and HWF planners regarding mental health and burnout, there is an inevitable need to estimate the costs, long-term benefits, and HWF shortages as the result of poor mental health and burnout in healthcare on a system level (Dewa et al. 2014a, b; Noben et al. 2014, 2015). In order to realize effective prevention and intervention strategies, it is essential to analyze cost-benefit ratios and long-term consequences of mental health and well-being characteristics of HWF, as well as building predictive models: e.g., estimating shortage of professionals because of poor mental health or burnout, calculating the costs of training, etc. Investing into HWF education and training is also an urgent need in terms of promoting mental health approach, formulating realistic and clear expectations of the job, and supporting upskilling. Several skill-sets could ease the rapidly changing scope of practice of health professionals (e.g., communication, resilience, stress relief, coping with negative events, overcome anger and other negative emotions, and maintain strong effective relationship with colleagues). Educating the HWF for mental preparedness should start already at the level of higher education and should be built in the CPD. The concept of student burnout emerged in the last decade, emphasizing the endangered situation of medical students being exhausted already during medical studies. The most promising protective factor against burnout is increased engagement, absorption, and dedication to medical studies and profession. If highly engaged and dedicated students experience high level burnout during medical studies, there is a risk of drop out and leaving the medical profession, which causes difficulties in HWF planning. Medical students suffering from burnout during resident years or at the university might choose not to be providing direct patient care but rather staying professionally active in the other (related) fields of the health sector. Thus, monitoring the mental health during both higher and further education is essential for effective HWP. To summarize the conclusions (Fig. 8), we can underline the importance of the dynamic, multidimensional, and functional holistic health concept in the framework of the biopsychosocial-spiritual model regarding the mental health and well-being of the HWF. Among critical success factors of HWF development, the healthy HWF, that is, the mental health and well-being characteristics of the HWF was emphasized, because only healthy HWF can be efficiently planned. There is a need for awareness raising of mental preparedness, mental health, and well-being factors of HWF development. For efficient planning and feasible and sustainable policy interventions, coordinated mechanisms of multiple environments and engagement of various layers are needed. There is a shared responsibility of different levels – individual, organizational, and policy level – to emphasize explicit goals of promoting and strengthening mental health of HWF as well as supporting HWF planning in the long term. Tasks concerning monitoring, training, and implementing interventions of each level could contribute to more developed HWF with improved mental health and well-being. Success can be only achieved, when we jointly care for a healthy HWF. WHO Europe Region covers a wider range of countries than the EU MS, it also covers non-EU countries. Dewa CS, Jacobs P, Thanh NX, Loong D. An estimate of the cost of burnout on early retirement and reduction in clinical hours of practicing physicians in Canada BMC Health Serv Res. 2014a;14:254–263. https://doi.org/10.1186/1472-6963-14-254. Kaplan G, Bo-Linn G, Carayon P, Pronovost P, Rouse W, Reid P, Saunders R. Bringing a systems approach to health. NAM Perspect. 2013. https://doi.org/10.31478/201307a. Ricou B, Gigon F, Durand-Steiner E, Liesenberg M, Chemin-Renais C, Merlani P, Delaloye S. Initiative for burnout of ICU caregivers: feasibility and preliminary results of a psychological support. J Intensive Care Med. 2018; https://doi.org/10.1177/0885066618768223. Roberfroid D, Leonard C, Stordeur S. Physician supply forecast: better than peering in a crystal ball? Hum Resour Health. 2009;7:–10. https://doi.org/10.1186/1478-4491-7-10.